We were all disappointed when this functionality was removed from the iOS 4 beta before final release. 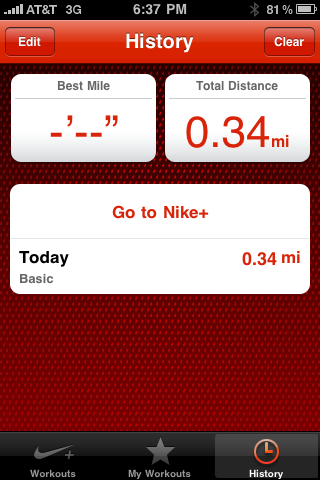 Not a big surprise as iOS 4 Nike+ is the buggiest I’ve ever seen, so I’m sure it was an easy decision to cut it. Hopefully now they’ve worked out all their bugs and this update is going to stick till the final iOS 4.1 final release. Like iOS 4 beta the over the air sync isn’t yet functioning, when trying to sync it pops up an error saying the service isn’t available. We’ll try again next beta and hopefully can fully test this! I just accepted the loss of verbal updates and would just end / begin a new workout well it stopped tracking miles. I was excited to try my luck with the iPhone 4 yesterday, but I couldn’t even get it to find my shoe sensor. 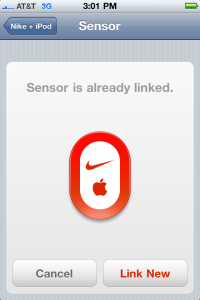 No matter what the Nike+ app wouldn’t detect my sensor and had to fall back to using my old 3GS. UPDATE The fix below may also resolve the other issue I mentioned above in addition to just syncing the sensor. 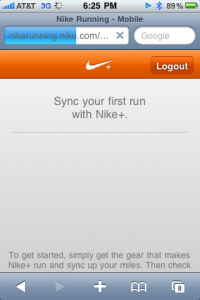 After contacting @NikePlus I was told to do a general iPhone settings reset, reset the phone, and try again. 1) Settings > General > Reset (all the way at bottom) > Reset All Settings. This will not remove any data or mess up any stored passwords for apps and such. 2) After the iPhone boots back up, restart it again. To do this press and hold the lock button on the top of the phone and then press and hold the home button…do not let go until you see the black screen with the Apple logo. 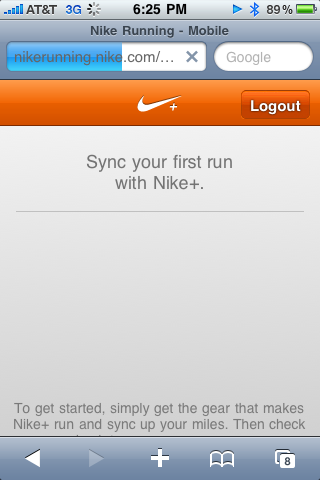 3) Once the iPhone boots back, go to Settings > Nike + iPod and click on Sensor to try syncing it again. You may also need to give the little button on the bottom of the sensor a series of quick presses. The first time I tried the above I still couldn’t connect. So I left the Nike+ settings and returned the home screen. I then pressed the little button a few more times, went back into Nike+ settings, threw the sensor back in my shoe and gave the sync another try. This time around it worked! Hopefully this get’s it going for you as well. Thanks for the feedback. We and Apple are aware that some users are having both problems. Hoping for a quick fix! Please keep in mind that Apple is control of creating the app for Nike+, as it requires more access than a standard third party app. So don’t blame Nike, there is nothing they can do directly. They can only work with Apple to get it resolved. The rumors for the heart rate monitor (HRM) were rekindled just a few weeks ago when an official Nike+ forum member announced the Nike+ HRM would be coming June 1st. That date has come and gone, but today it’s officially out. It’s currently only compatible with the Nike+ Sportband and 5th generation iPod nano. I have a feeling it won’t be too long before we get an update (iOS 4?) for iPhone and iPod touch that supports this as well. 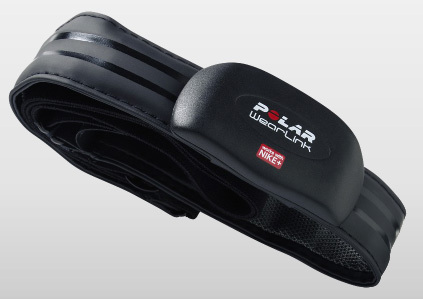 Also, similar to Nike+ / Apple collaboration, the HRM is manufactured by Polar. Now you can put more heart into every run by tracking your heart rate with the new Polar Wearlink+ Transmitter. Just fit the strap snugly around your chest and take it for a spin to hear spoken feedback and see your beats per minute during your Nike+ iPod workout, or see the same information while you run with the Nike+ SportBand. And that’s just the start of it. Nikeplus.com gives you an even better read on your progress. It’s available for purchase $69.95 on the Nike+ website. I’ve been thinking about getting a heart rate monitor to give me more data while running with Nike+, but with the rumors about a Nike+ compatible heart rate monitor coming I decided to hold off. Now the rumors have finally been confirmed by official Nike+ forum user, Clover, with a launch date of June 1st in the US and in Canada later in the month. International dates are still up in the air, but shouldn’t be too far after that. We’ll be picking up a couple of these when they are release so come back the first week of June for our review. Great news! I have a U.S. launch date for the Nike+ compatible heart rate monitor. It will officially launch on June 1, 2010, although it may reach some retail outlets slightly sooner. It will reach Canadian markets in June and will launch internationally in summer 2010, exact date to be determined. I know you’re going to ask, so I’ll answer pre-emptively: no, I am not able to discuss price, color, device compatibility, and other details at this point. Stay tuned. UPDATE Unfortunately this was removed during the beta cycle and does not appear in the final iOS 4 Golden Master. Here’s to hoping it comes back in iOS 4.1! I’ve been using Nike+ for about 8 months now and love it. One thing that always seemed obvious to me for the iPhone version of the built in app was to send your run data right from the iPhone. This would have come in handy a couple times I was running while out of town, but lucky for me I was able to sync my runs through my MacBook…even though it wasn’t my master sync computer. From now on though I see myself just doing it on the phone, even at home. 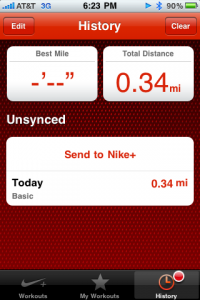 All you do is tap “Send to Nike+” in your history. It sends the data to Nike+ and then opens up safari where you can then login to Nike+ to view your run. Going back to the history page when you have everything synced shows just a “Go to Nike+” link. This was still a bit buggy, but hopefully this is fixed in beta 2.